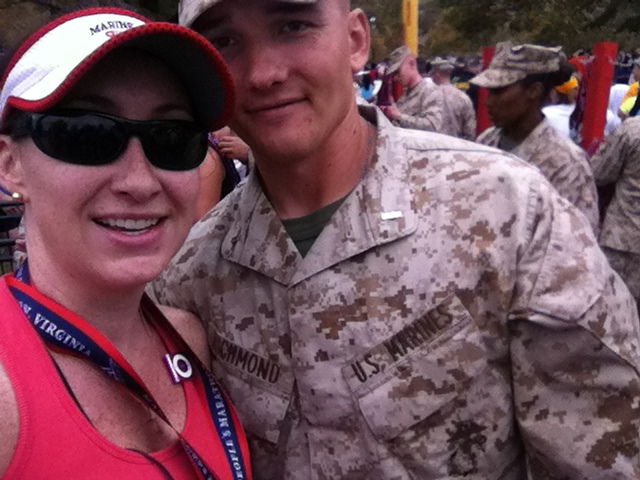 I am so superstitious, and given my luck with injury/illness this year, I’ve not posted much on my training for the Marine Corps Marathon, fearing that I’d somehow “jinx” myself. Well, the race was yesterday, and I’m thrilled to report that it was AMAZING: a super event with my fastest marathon time yet. First things first: I ran on the Niall Mellon Township Trust Team. NMTT is Irish-based charitable organization that focuses on building homes for the poor throughout Africa. This was the first year that NMTT pulled a team together for MCM, so only a small (but very committed) crew of runners participated. 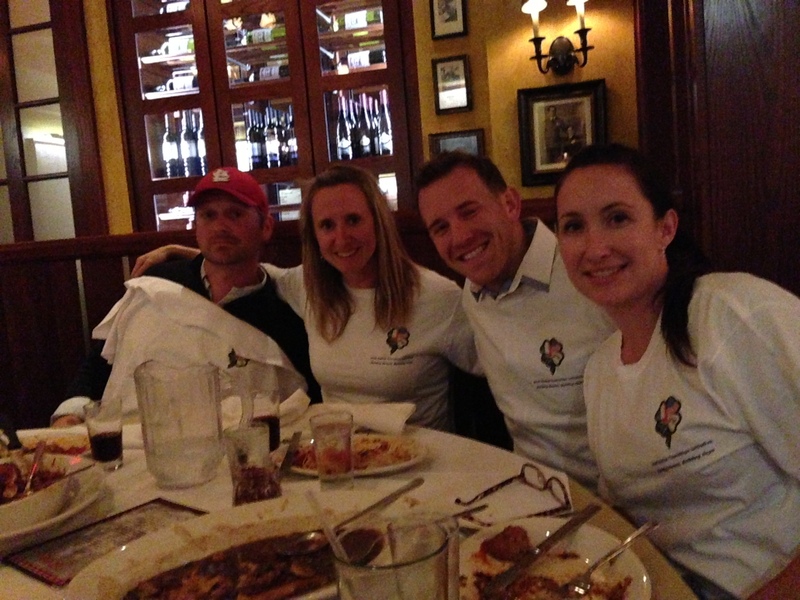 Here’s a shot of us “carb loading” at Carmine’s in Chinatown on Saturday night. I’d spent hours over the past week prepping supplies for the race, only to come home after our team dinner on Saturday to find my children had demolished my energy chews while the grandparents were babysitting. Hope you enjoyed them, kids! Now I understand why you were running wild all night! Several other things that I (successfully) managed to pull together for the race: NorthFace arm warmers, Lucy Crops (get them now, they’re on sale), Lululemon tank, Saucony Kinvara 2s (also on sale) and Feetures! brand socks. There was, understandably, lots of drama regarding the weather. Race organizers and runners were all tracking Hurricane Sandy and frankly, I think we were preparing for the worst. Lucky for everyone, the weather (aside from the wind on Hains Point) was perfect: cool and overcast! 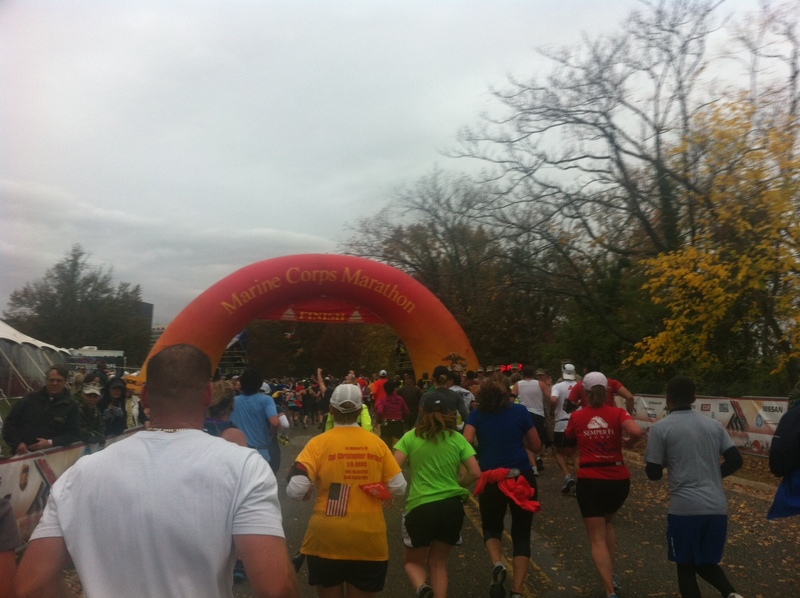 This is my second Marine Corps Marathon and again I was stuck by the complete professionalism and enthusiasm of the hundreds of Marines working to support the event. At every turn, support crews were ready to hand out water, Gatorade, vaseline, food, and encouragement. Everything was done with smiles and trademark Marine humor: at one refueling stop I asked for a cup of water…only to be told by a young Marine that only vodka was available. The signs were also great this year. My personal favorite was at milepost 1: Paul Ryan is already done! Regarding the course: I was worried about the Lee Highway and Georgetown Reservoir hills (despite training hard for them), but was pleasantly surprised by my pace (just over 10 minute miles). 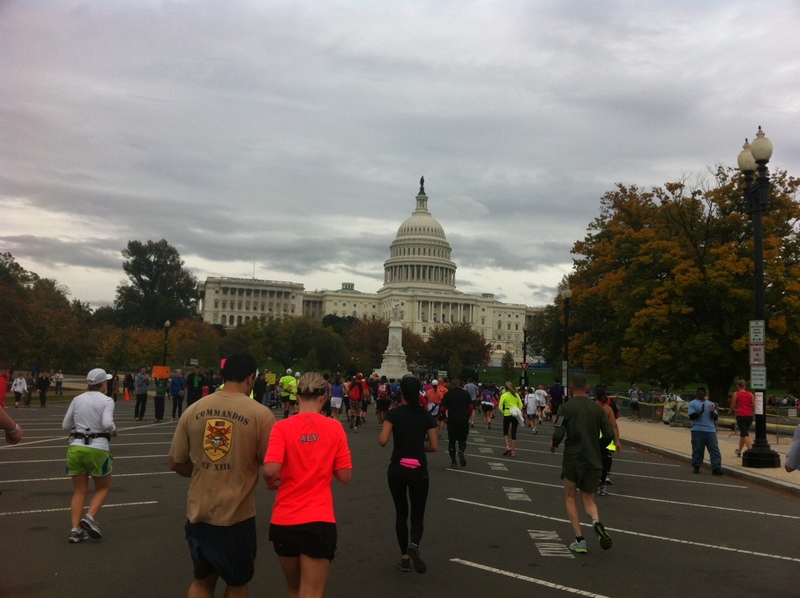 Hains Point and the Mall were also easier than I expected. Unfortunately, the 14th Bridge seemed to go on forever, making the run around Crystal City nearly impossible to complete at pace. I slowed considerably…though I give myself credit for not stopping at the Dunkin Donuts “munchkins” table (my husband had 3 cups of donut holes!!!). 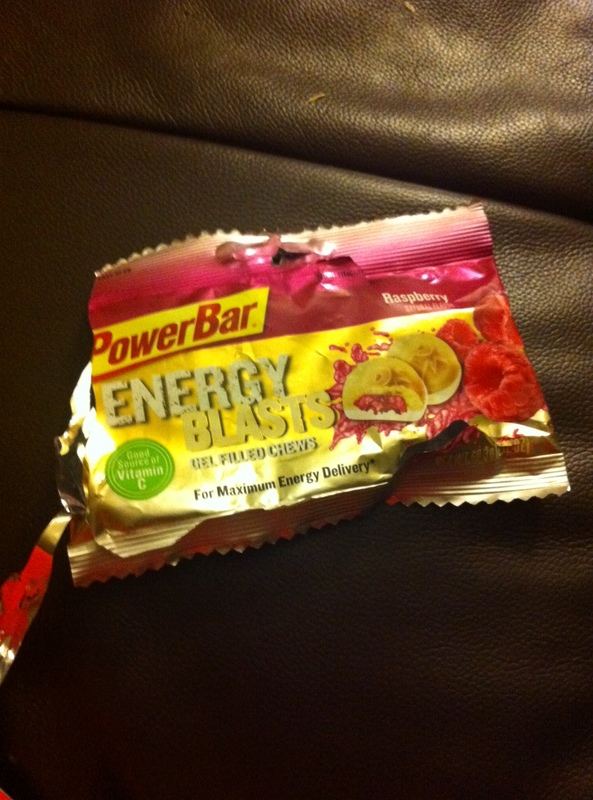 I picked up speed and crushed mile 26, running the final hill with my last bit of energy. I finished in 5:04, my fastest marathon yet…though sadly not swift enough to catch my husband (he finished in just under 5 hours). I’ll be back again, MCM! You guys put on a wonderful race! Acumen Race for a Cause and The Reading Connection! 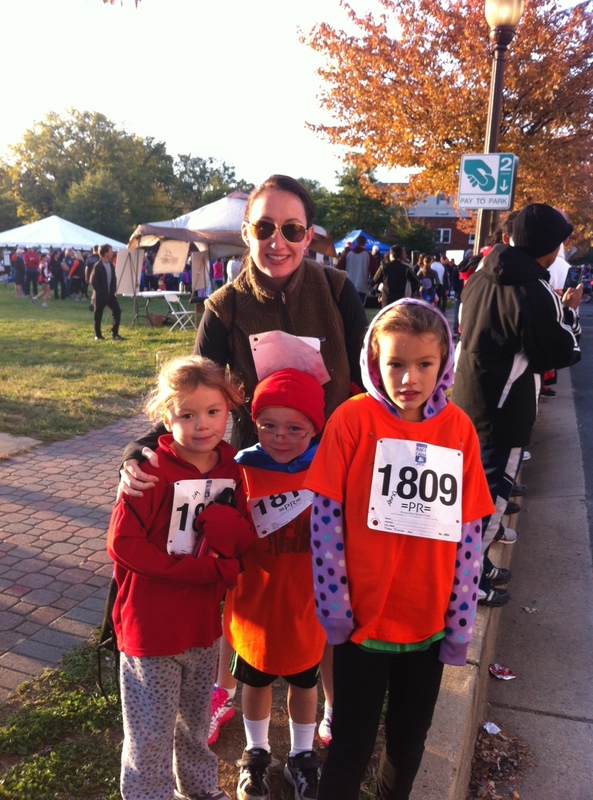 My kids and I were up bright and early for this morning’s 1-mile Acumen Race for a Cause “Fun Run” in North Arlington. Hundreds ran with us and even more participated in the longer 8k through Clarendon. Acumen Race for a Cause is a perfect marriage of fitness and fundraising. It involves a unique concept: each runner gets to designate a local charity in the company’s non-profit portfolio. Proceeds from the race are split amongst all participating groups, proportionate with the selections of participating runners. My family and I ran for Arlington’s Reading Connection: an amazing non-profit organization that promotes literacy through free book distribution, read-alouds, and backpack drives for at-risk children. I volunteer with the Reading Connection several times a month…it’s a great organization that makes a real difference in the lives of local kids. We’re all thrilled with the Acumen partnership and I can’t wait to hear about the final fundraising tally! On a side note, race support and the Potomac River Running swag bag were wonderful! Tons of post-race food + a bag full of hair ties, Emergen-C, granola, and a neat technical t-shirt. Great job!